Today, the Gold One Dollar Coin remembers when the New York Stock Exchange shut its doors starting on September 20, 1873 and did not re-open until September 30, 1873. Wall Street, Saturday, Sept. 20—6 p. m.
On ‘Change to-day cotton was quiet, both for spot and future, but prices were not essentially changed. Flour, wheat and corn were lower; values for which were more or less nominal. The events that have transpired to-day in Wall Street ought to be contemplated with the utmost calmness. This is no time for men to lose their judgment. If the Stock Exchange suspended its labors it was wisely done in anticipation of the grander evils that seemed to be surging onward with the great wave of speculation that has threatened to submerge the street. Men whose names have been honored in every department of trade were going down; firms which had successfully resisted the worst of former crises were being submerged; values were shrinking with a rapidity that could neither be controlled nor followed; stocks which but a few days ago were regarded among the choicest of mercantile securities lost prestige by depreciating fifteen, twenty and thirty per cent. “Margins” were being exhausted; customers were either too distant or unable to make good the differences; sales took place at a sacrifice; money hardened; the most creditable men in the street were unable to obtain funds even on the best of paper at less than one and one half and two per cent, so that it was almost useless to attempt to continue business on a sale basis; the excitement grew apace, runs began on well-known banks—strong inherently, yet victims of the hour; suspensions followed, and rumors filled the air well calculated to demoralize the best regulated minds. It was but natural, therefore, with the experience of the past before them, that the Governing Committee of the Stock Exchange should determine to suspend the business of the Board and create an interval during which values could settle and discretion could recover its equilibrium. This has been done, and we believe that the course of events, both here and elsewhere, will attest the prudence of the policy adopted. It is, perhaps, the second time in the history of Wall Street that such an event has taken place; yet, never before has there been such a combination of incidents calculated to bring about this result. The panic started with the failure of one or two parties identified with incomplete railroads. The stock market at the time was in a feverish condition, responsive to light causes and tremulous in the extreme. Its strength consisted in two or three stocks, firmly upheld by great operators. They had come to be regarded as the key-note of the market. Even these, however, could not at last resist the pressure. They “broke,” and in doing so naturally carried with them the entire list of speculative securities. The decline was somewhat in proportion to nominal values, and hence when parties holding other than the dividend paying stocks sought accommodation in banks or trust companies to help them out of the quandary that bad been forced, they found only discomfiture. Thus the weakness of a few railroads has extended through the entire network of our local finance. The pulling down of one or two great houses produced distrust. Money, always timid, retreated into private recesses. Depositors commenced to run upon banks; the banks have been unable to afford their usual accommodations, have refused each other’s checks though certified, and at last, as a consequence of universal doubt, have been compelled in self-defense to arrange with the Clearing House for the issue by the latter of certain loan certificates based on acceptable assets, which are to be received in the settlement of all Clearing House differences in the place of legal tender notes. Practically this action means the expansion of bank credits and the economizing of legal tenders. It aids the banks, but it is yet to be seen what facilities are thus extended to depositors and business men. As regards the savings banks, there is no good reason why, if the officers of the same have rigidly done their duty, there should be any cause of alarm. Their securities are regulated by law, and they are not such as ordinarily fluctuate in value. They should not be materially depreciated now. Hence a run upon them is both injudicious and unwarranted by events. The depositor should understand that thus far our financial troubles result only from local speculation. Crops are good; business is first rate; our merchants have rarely done better than they are doing this season. They are not suffering from this temporary disturbance, and we can safely count on a large fall trade and handsome returns. There may be a temporary panic reaching from New York to Chicago and farther West, because there is a necessary relationship between the banking houses of the respective sections incident to the movement of crops and ordinary commercial transactions, but taking a cheerful view we cannot see any other in the action of our banks thus far than purely precautionary measures, which are as much calculated for the protection of the depositor as for their own. Whatever is weak and unworthy will go down. So let it be. Thunder storms always clear the atmosphere. Whatever is good will come forth from the trial purified and more thoroughly worthy of public confidence than before. Coming back to the subject of the Stock Exchange, it is to be hoped that no attempt will be made to resume business until after this whirlwind has passed away. No matter how many firms may be loaded with stocks, no matter how speculation may suffer, no matter how many hundreds may desire to “receive” or “deliver,” there is not a contingency that can be thought of which should induce the Governing Committee of that body to open its doors until this excitement is in a shape that can be handled and the bankers and brokers have become so subdued as that they can be again trusted on their menial legs. All in all, the situation is one of great gravity, and for that very reason it should command the utmost calmness on the part of the public. In the midst of the wildest excitement to-day the writer of these lines saw a young clerk deposit in a bank, where fifty others had gathered to withdraw money, a check for $100,000. For if the banks of America yield to this wave that has started so like a rivulet where can credit stand and what will eventually be the value of an American greenback? Patriotism commerce, duty, everything appeals to the public at this juncture to exercise wisdom, resist panic, afford strength, and aid in the restoration of public confidence. It is not difficult to analyze the situation in a nutshell. It results from inflation of credits; the expansion of business on a small capital; the attempt to do too much without commensurate means; an ambition to grow rich, individually and nationally, with too much haste; a disposition to assume debt that another generation is expected to pay, and an extravagance in social life that is calculated to destroy the energies of the best people in the world. The impending ruin may extend. We trust and believe it will be checked; but, in any event, a lesson will be taught that is full of compensations. We shall learn to know the meaning of dollars. Institutions will learn the meaning of conservatism and a proper oversight of their interior concerns. Congress will learn to recognize the duty it owes to commerce in throwing around it the protection of a banking system that cannot be disturbed by the failure of even a score or millionaires, and the country at large will acquire additional strength in avoiding speculations that are but pictures on paper and frauds on the understanding. 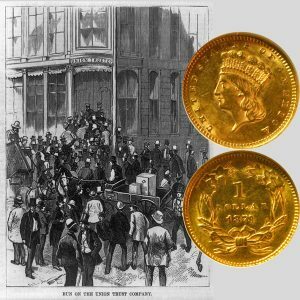 The Gold One Dollar Coin shows with an artist’s image of the 1873 panic on Wall Street.